We learnt to read in Lambeth Libraries. Our kids use them. We know they matter. We are proud that we helped save our local library. Under previous Councils there was no guarantee that there would always be a library here in Waterloo. We fought to keep one. We campaigned. We petitioned. We took risks. We supported local group Oasis right from the start. 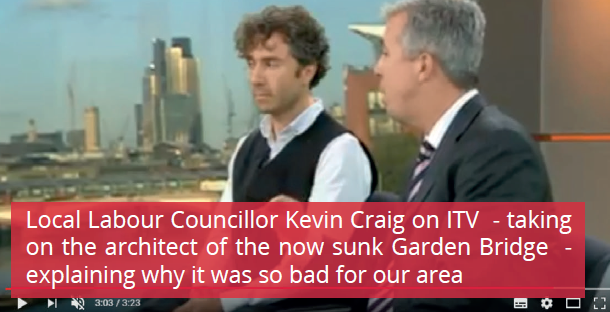 We spoke at Lambeth Council. We lobbied the Leader of Lambeth Council. Now a lovely library is on Kennington Road. It’s being used more than ever and it’s thanks to us, Labour Lambeth Council and the amazing Oasis. Make sure you and all your friends and family use it!! Waterloo Library is situated in The Oasis Centre, opposite Lambeth North tube station, in a building shared with the Oasis Hub Coffee House. Despite horrific budget cuts of 56 per cent that Lambeth Council has endured – we have protected improved the library provision in Waterloo. In the future another and even better library will replace this one. That is what we will deliver. London Nautical School, Oasis Academy, Walnutree Walk School, Oasis Academy Johanna and Archbishop Sumner Primary are all VITAL for our local community and our children. Kevin Craig and Jennie Mosley have been supportive to these schools since day one of being elected. We have also led the way in opposing Conservative Government cuts by campaigning with teachers, local parents and residents. 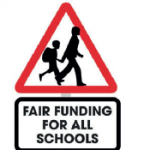 Lambeth Labour is SUPPORTING the parent-led Fair Funding Campaign to protect local state schools. 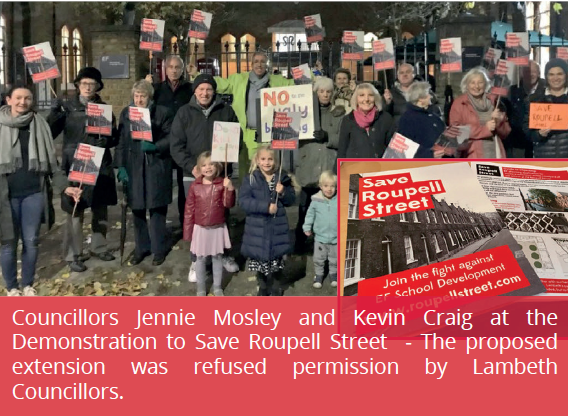 We helped STOP Roupell Street being damaged forever by the terrible proposals from the EF Language School. We campaigned with residents. We spoke at Planning Committee. We highlighted at every opportunity why these plans would be so damaging. Together we you – We Won. 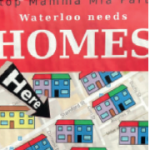 The plans were turned down at Lambeth’s Planning Committee after we spoke against them – again alongside brilliant local campaigners including www.roupellstreet.com LERA and many others. Our area continues to be in desperate need for more affordable homes. As far back as 2015 your local Labour Councillors said on BBC Radio 4 that new rules were needed to force developers to build more affordable homes. 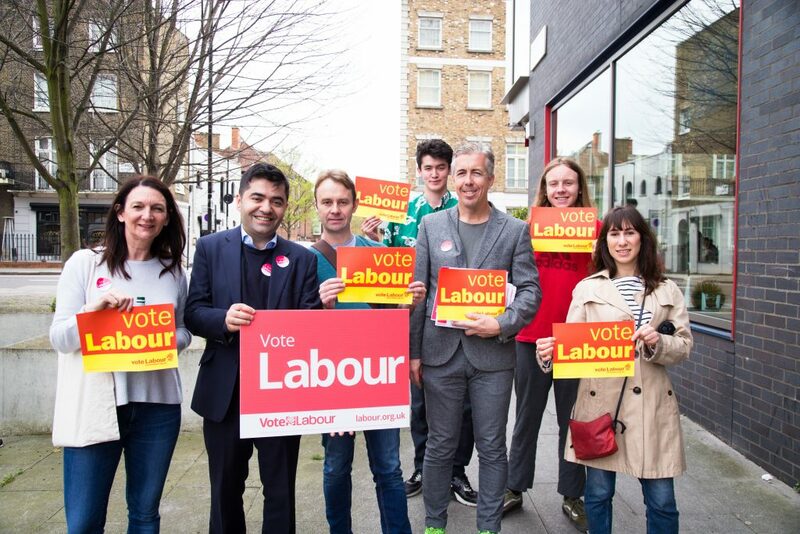 Now Labour’s Jeremy Corbyn and Sadiq Khan have committed to a million new homes in London and Lambeth Labour will drive up standards for renters and deliver more affordable homes. More must always be done. We campaigned alongside Lambeth Labour and Kate Hoey MP to protect local Housing Co-Operatives against punishing Conservative Government reforms which would have seen thousands of homes lost to future generations. Your local Labour Councillors cycle thousands of miles every year around this area and elsewhere in Lambeth. Under Labour Lambeth aims to become the most cycle friendly borough in London. 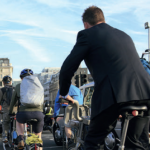 Lambeth is already one of the leading cycling boroughs in London and has won awards for various projects including its HGV/cycle training and secure residential cycle parking. Since being elected we have consistently spoke out in support of cycling. Since being elected we have taken part in experiments to identify less polluted ways to walk around local streets. We have tackled pollution caused by Bus and Taxi engines not being turned off. Under Labour Lambeth will enforce TOUGHER sanctions for noisy neighbours and expand enforcement teams to cut fly-tipping and littering. Right now (April 2018) we are campaigning to save trees on Baylis Road. Also to keep Lambeth clean 3000 fines have been handed out this year to fly tippers. We will campaign for this tough approach to get even harder. We will push Lambeth Council to adopt its ambitious air quality Action Plan with nearly 60 actions to cut pollution. Traffic congestion remains a huge problem for our area. 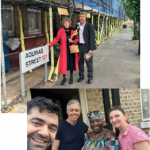 We worked hard with local MP Kate Hoey to keep up the pressure on Lambeth Council and partners to improve health and safety around scaffolding around Aquinas Street. We acted when residents of Matheson Lang Gardens asked for CCTV. We are currently trying to stop the plans for a second zipwire in Archbishop’s Park. We have taken up hundreds of queries small and large. We actively challenge financial charges from the Council when we think they need to be questioned or there might have been mistakes. 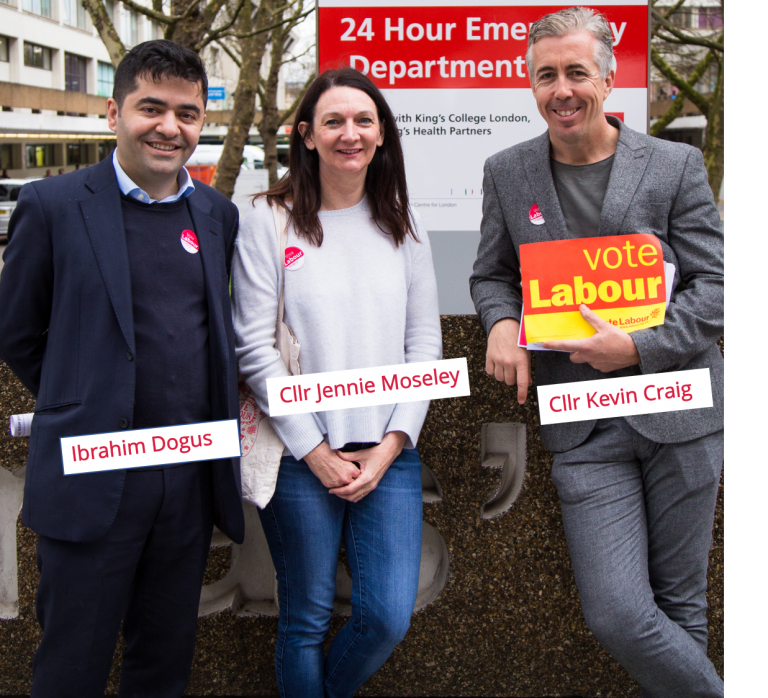 Kevin Jennie and Ibrahim all supported Remain. 79% of Lambeth residents voted to remain in the EU. Jennie and Kevin’s family came to this country from Ireland. Ibrahim came to this country as a refugee. A re-elected Lambeth Labour Council will continue fighting against a disastrous Conservative Hard Brexit. We will challenge any harm to the rights of EU citizens. EU citizens help run our NHS. They work in all parts of the public sector and economy. The Waterloo/ North Lambeth area is blessed with an amazing array of local groups of people, businesses and activists. There are so many groups to whom we all owe a debt. They include SOWN, WCDG, TCOS, Jubilee Gardens Trust, South Bank BID, many tenants and residents groups including China Walk, Wellington Mills, LERA, Lambeth Towers, The Housing Co-Ops, and many many others not named here. We have often been called upon to help communicate local issues on behalf of these groups so that Lambeth Council understands our area. 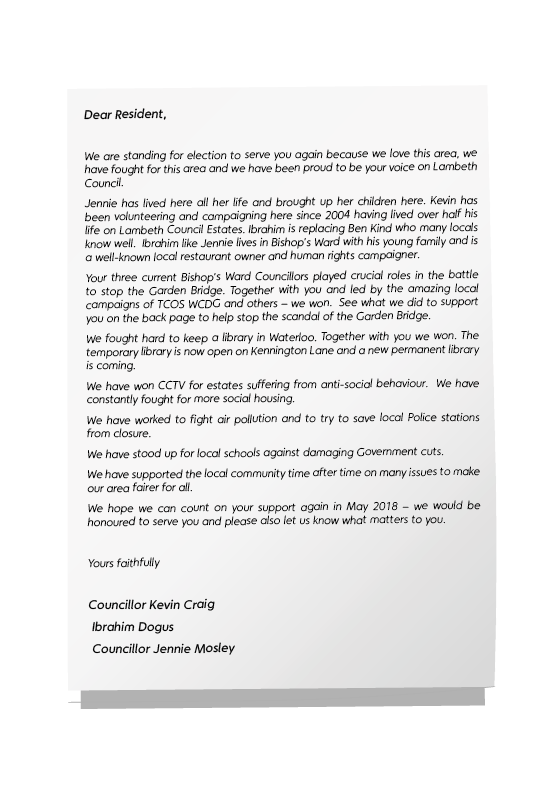 We will continue to speak up for you with Lambeth Council. We promise again – like we did in 2014 – to PUT LOCAL PEOPLE FIRST.